Like many a whovian out there, I totally rejoiced when the 8th Doctor, Paul McGann, made his glorious return to the screen. I could care less that it was a webisode and not a full fledged story. Granted, I would have preferred that, but I accept it like I do the long breaks between regular Doctor Who episodes. Better than no Who! McGann was absolutely brilliant once again and makes even a stronger case that he should not be done with screen appearances as The Doctor! 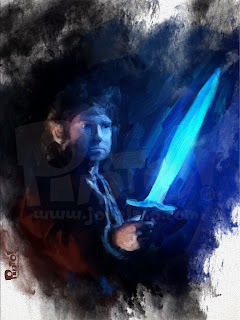 If Peter Davison is the Doctor that first introduced me to Doctor Who, it is Paul McGann that brought me back! 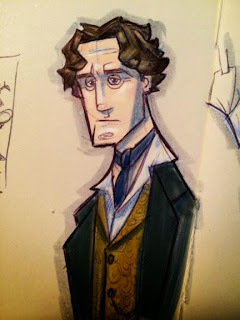 I have not stopped doodling the 8th Doctor since this aired. Here are some of my artistic ramblings. This is a small doodle in my sketchbook that I digitally added some color to. 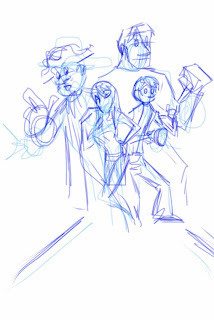 Rough sketch done early one morning when I couldn't sleep. A merged sketch from several sources. Worked on these with my tablet mostly while watching TV at night. Phantom color study and a Buggy. Work has been keeping me so busy and the holiday season is upon us all as well. Never get much done during that time period. Got lots O'deadlines!! I did manage to do a quick color study for the Funky Phantom and even did a sketch of another Scooby-Doo clone that people kept pestering me about! 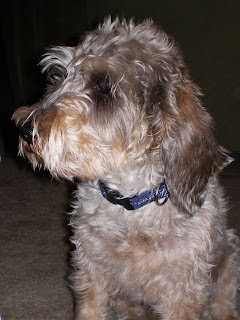 See, I DO listen. Sometimes. Work has been keeping me really busy and I already know that next week will be loaded! 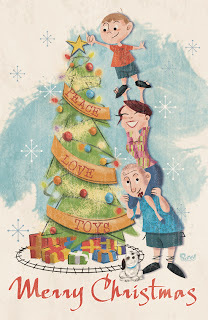 Really inching along with this one and I know I have a Christmas card to do as well. Maybe I should cut down on my sleeping in order to get more done. Just a thought. 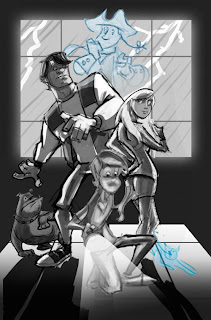 I do have a more "readable" comp ready and work has progressed on tighter drawings on some of the characters. So there is that! Hope to have more really soon. 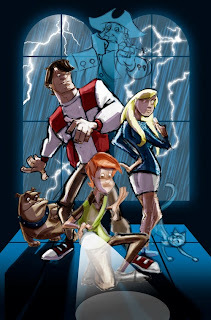 Anyone remember the Funky Phantom?? 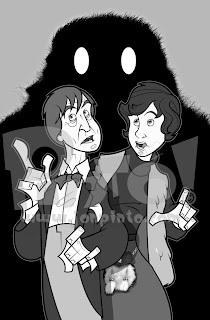 The Second Doctor, Jamie and a Yeti! Done! I really like that this is in black and white and was a bit more challenging that I anticipated. Really need to take notice of all the values. Hope I did that well enough. Can't wait to get this one printed!! 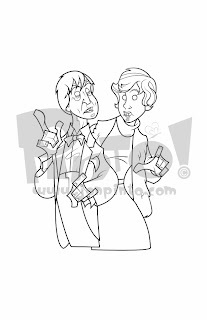 I have to say, the 2nd Doctor is SO much fun to draw! This piece is also now available as a t-shirt, sticker or an iPhone case at my Red Bubble store. Prints will be available soon as well. Almost done! Thankfully my freelance workload was light this week and I was really able to crank on this! I (thankfully) know that this will not last either. Actually had to scrap plans for one of my pieces to have ready for Hurricane Who this year. 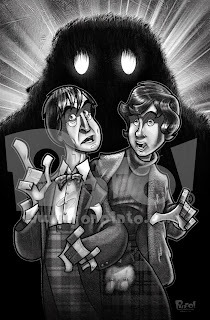 It's ok as I will have four new Who pics as well as other art to offer. Plus, I think I will be able to use my concept in the not to distant future with the 12th Doctor in it instead. Anyway, here is the flat vector version of the pic all ready for paint and texture and my value study with the pencil drawings as well. Inking is done and it's looking great! I don't know what I did different but I am really inspired by my drawing of Troughton. I wish all my work held up as well. Once I had my line work all set I quickly set about filling it with flat color as I always do at this stage. It wasn't until I was done that I had to stop myself since I finally remembered that this picture was going to be black and white! I duplicated my color layers and re-filled them with grayscale tones. I kept the color just in case I might need a color version in the future. In fact, I know when I will need it but that is for another time.